...and the Great Debate unfolds ATOM YEAR 1 has probably been marked by more debate on a single subject than any other twelve months in the world's history. Social, economic and political as well as purely technical issues have been pressing for realistic solution. Let us look at these issues and see where we stand: CIVILIAN VS. MILITARY Because the atomic bomb is the world's greatest weapon, the armed forces would like to control it. But because atomic energy can also be used for peaceful, beneficial purposes, civilian control seems equally essential. These conflicting viewpoints had their strong proponents before the Congress which finally reached a fairly satisfactory compromise in the Atomic Energy Bill of 1946, setting up a competent civil board with which the armed forces will have continuing liaison. As we go to press, just before Year 2 of the Atomic Age begins, this bill has passed the Senate, but there is still a question how rapidly it will be enacted into law. PRIVATE VS. PUBLIC Atomic energy is "too big" and "too hot" to be handled privately. It must be nationalized and internationalized. The questions are [[italics]]how[[end italics]] and [[italics]]to what extent[[end italics]]. Fortunately, as the "boxes" on these pages show, there are means that may attain reasonable safety against misuse of the atom, and still do without public control of many "non-dangerous" applications. SECRECY VS. FREE SCIENCE Throughout the first year of the Atomic Age hot debate has raged around "keeping the secret of the bomb." To prevent potential enemies from making atom bombs some have urged a complete blackout of all phases of atomic energy - even of the scientific fundamentals of nuclear physics. Others have sought immediate and complete disclosure of all bomb "secrets," both scientific and technological. These have held that such information cannot be effectively hidden, that secrecy blocks progress and breeds wars. A year of debate has brought the great mass of vocal opinion to this middle ground: (1) Ease restrictions on the exchange of basic physical knowledge. (2) Release for industry's benefit many of the devices and methods developed for the bomb project. (3) Hold tight to specialized information on atomic bombs and bomb-material production until international safeguards are fully operative. 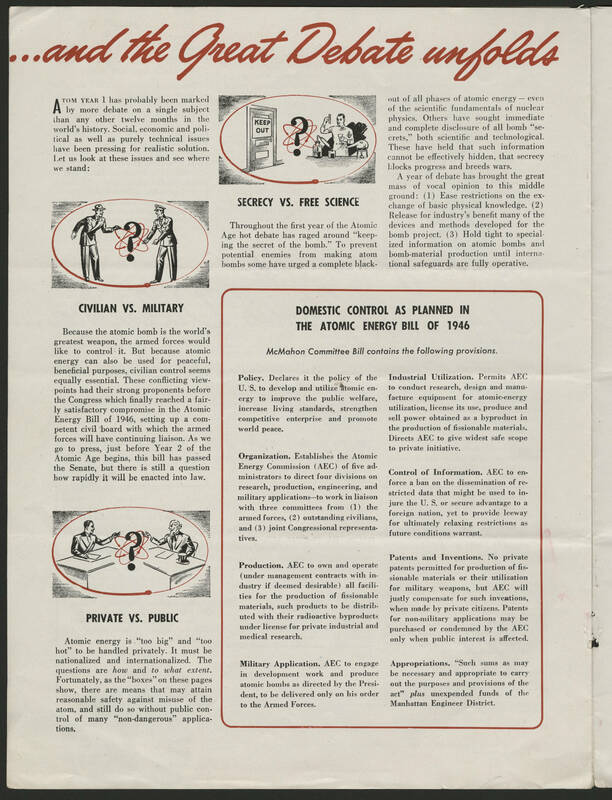 DOMESTIC CONTROL AS PLANNED IN THE ATOMIC ENERGY BILL OF 1946 McMahon Committee Bill contains the following provisions. [[bold]]Policy. [[end bold]] Declares it the policy of the U.S. to develop and utilize atomic energy to improve the public welfare, increase living standards, strengthen competitive enterprise and promote world peace. [[bold]]Organization. [[end bold]] Establishes the Atomic Energy Commission (AEC) of five administrators to direct four divisions of research, production, engineering, and military applications--to work in liaison with three committees from (1) the armed forces, (2) outstanding civilians, and (3) joint Congressional representatives. [[bold]]Production. [[end bold]] AEC to own and operate (under management contracts with industry if deemed desirable) all facilities for the production of fissionable materials, such products to be distributed with their radioactive byproducts under license for private industrial and medical research. [[bold]]Military Application. [[end bold]] AEC to engage in development work and produce atomic bombs as directed by the President, to be delivered only on his order to the Armed Forces. [[bold]]Industrial Utilization. [[end bold]] Permits AEC to conduct research, design and manufacture equipment for atomic-energy utilization, license its use, produce and sell power obtained as a byproduct in the production of fissionable materials. Directs AEC to give widest safe scope to private initiative. [[bold]]Control of Information. [[end bold]] AEC to enforce a ban on the dissemination of restricted data that might be used to injure U.S. or secure advantage to a foreign nation, yet to provide leeway for ultimately relaxing restrictions as future conditions warrant. [[bold]]Patents and Inventions. [[end bold]] No private patents permitted for production of fissionable materials or their utilization for military weapons, but AEC will justly compensate for such inventions, when made by private citizens. Patents for non-military applications may be purchased or condemned by AEC only when public interest is affected. [[bold]]Appropriations. [[end bold]] "Such sums as may be necessary and appropriate to carry out the purposes and provisions of the act" [[italics]]plus[[end italics]] unexpended funds of the Manhattan Engineer District.